If a taste for certain foods is heredity, then my boys inherited their taste for spicy foods from their dad. I’ve never seen little boys DRINK salsa from a bowl before my trio. Not long ago, one of my boys was playing with his food (imagine that! ), and he decided to mix salsa with his ketchup. Who knew that he would create a trend that would go viral with my triplets? Spicy Salsa Ketchup for everyone! 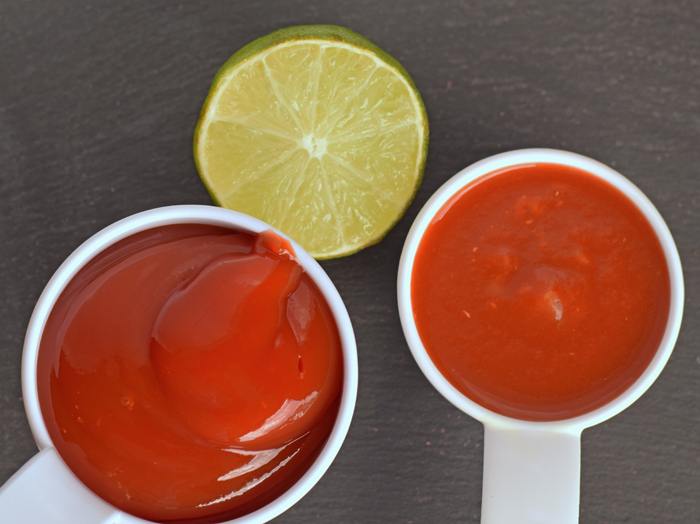 I have to admit that this Spicy Salsa Ketchup has a unique flavor, and since it’s half ketchup and half salsa, it pretty much goes with everything. 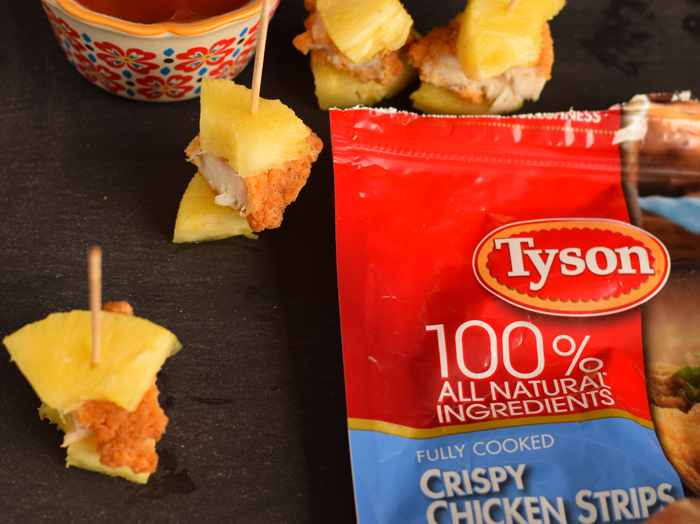 When I’m short on time, I can whip up these easy Pineapple Chicken Kabobs made with Tyson® Crispy Chicken Strips to pair with the Spicy Salsa Ketchup. The boys enjoy using the toothpicks to dip the chicken in the ketchup mixture. Optional: Have kids who love extra spice? Or are you making this for yourself? Experiment with adding different flavorful spices like chili powder or chipotle sauce! Mix the ketchup and salsa in a small bowl. 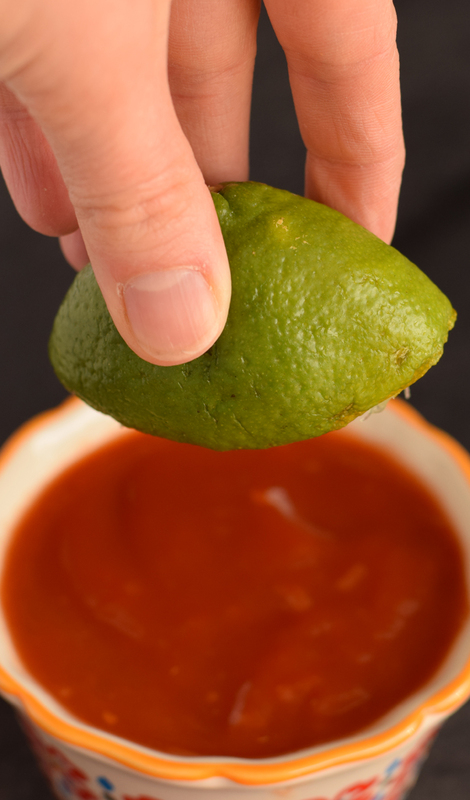 Squeeze the juice from the half of a lime in the ketchup mixture. Stir thoroughly and serve. If not serving immediately, store in the refrigerator. Looking for something quick and easy to pair with this? Tyson® Crispy Chicken Strips make great kabobs! Cook the Tyson® Crispy Chicken Strips as directed on the package. While they cook, cut a fresh pineapple into thin chunks. Once the Tyson® Crispy Chicken Strips have cooked thoroughly, cut them up into chunks. I was surprised by how much meat was on the Tyson® Crispy Chicken Strips! 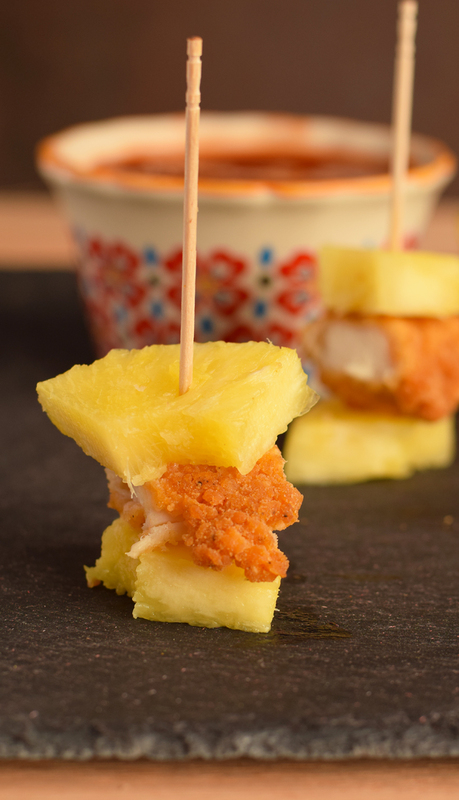 Using long toothpicks, layer a piece of pineapple, a piece of chicken, and a piece of pineapple. My boys love the pop of pineapple, and this simple kabob is a good fruit and protein snack solution with high quality and low effort. 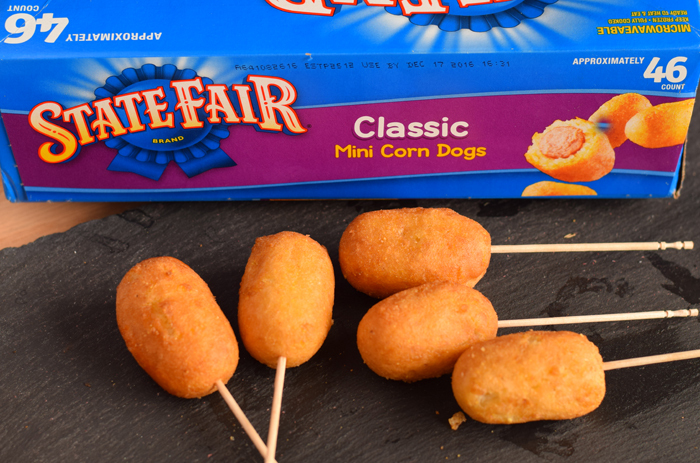 Of course, if you’re running even shorter on time or need another idea for an appetizer, State Fair® Mini Corn Dogs are a throw-in-the-oven and go dish! I added the long toothpicks to mine for easy dipping without messy fingers! I purchased all of my recipe products while at Walmart. 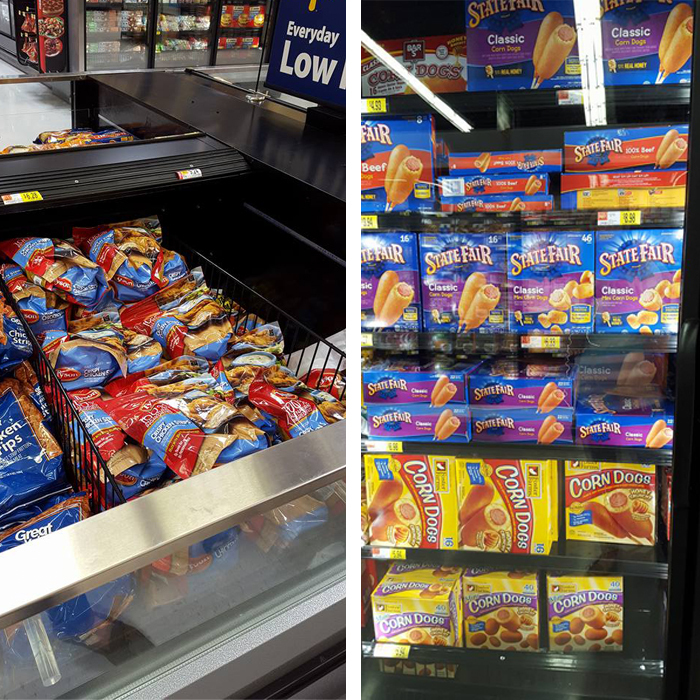 The Tyson® Crispy Chicken Strips and State Fair® Mini Corn Dogs are in the frozen food section. For a limited time, Buy any 2 participating Tyson®, Ball Park®, State Fair®, or Jimmy Dean® products at Walmart, snap a picture of your receipt, and get a movie ticket to see Teenage Mutant Ninja Turtles: Out of the Shadows in theaters June 3rd. Do you have kiddos excited for the movie? So, tell me, are my toddlers freaks of nature or do yours like spicy foods, too? 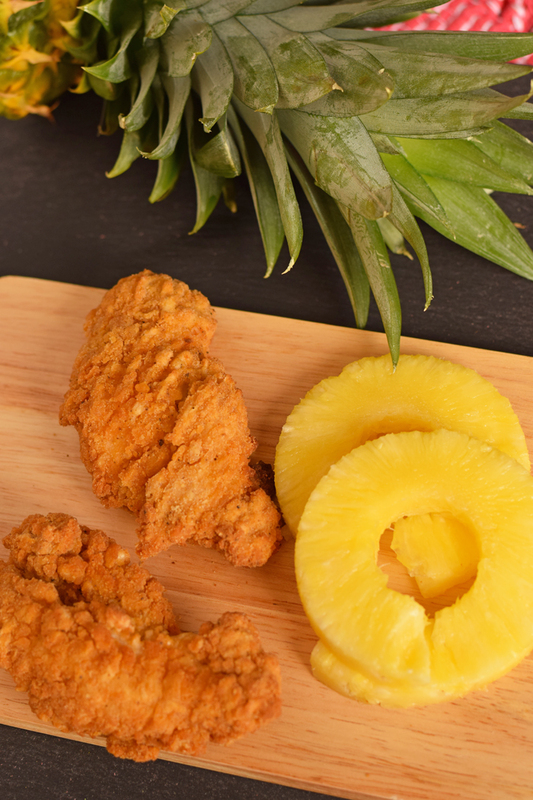 I love pineapple and chicken together and it just so happens I have that Tyson Chicken in my freezer right now! Great idea. Thanks. So simple…. yet so delish!!! Great idea! I would never have thought to mix these, but it actually sounds really tasty! 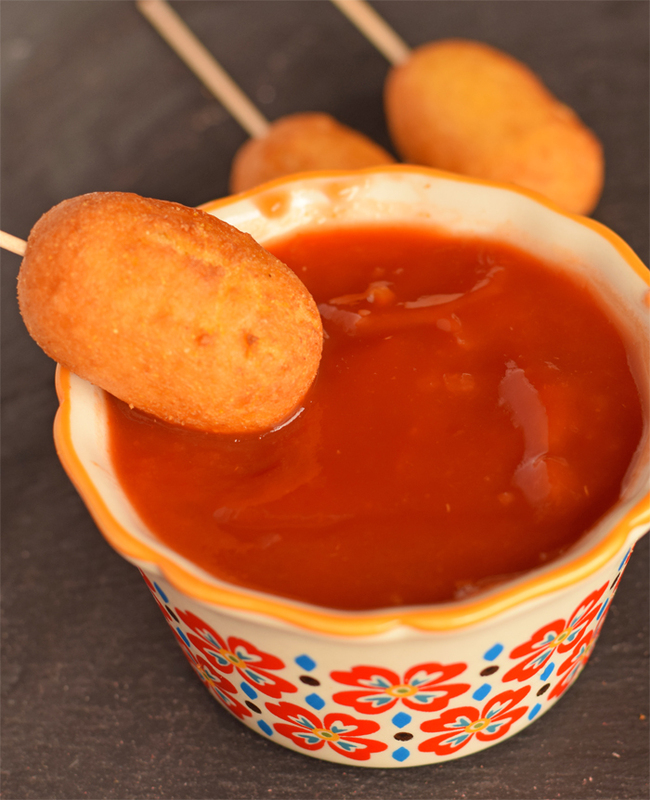 Love those mini corndogs and chicken kebabs! So much fun! I love these!!! Such a fun party snack and so easy!! Cant wait to try them! 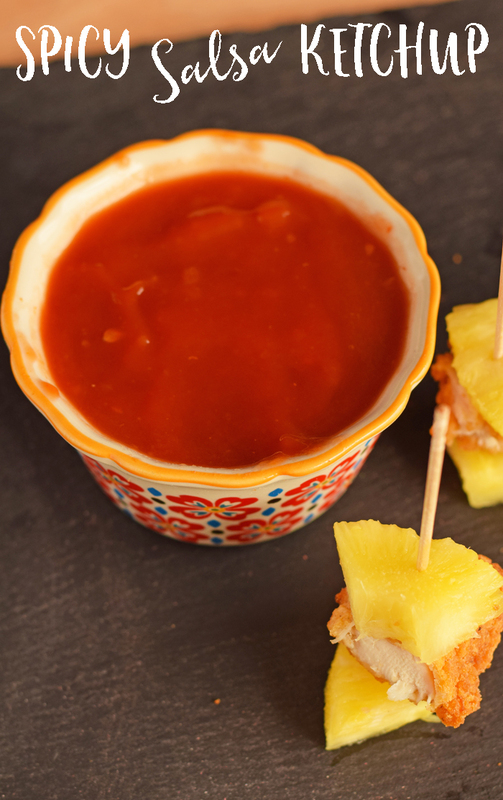 Pineapple chicken kabobs would be a great appetizer to share at a gathering. Love the spicy salsa ketchup addition! What a fun snack or appetizer! The sauce looks delicious! Oh yum! I would def make these for my family. Love the bite size appetizer idea too.